A gathering of the Montana and northern Rockies splitboard tribe. 2019 will be year three for the Bozeman splitfest and it is going to be epic! The main hub for the event will again be Map Brewery. 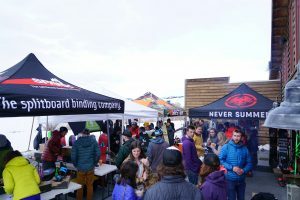 There will be demo equipment available from leading backcountry snowboard brands including Never Summer, Venture, Pallas, and Weston. Demo bindings? No problem, we’ll be there with our full demo fleet. In addition to the great demo, there will be organized tours and clinics during the day, music at night, and the event will conclude with epic raffle Saturday evening. All proceeds from the splitfest will benefit the GNFAC.